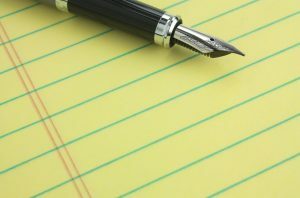 Although I typically use a keyboard on my computer or voice writing on my i-phone, I use pens daily. While a pen is much slower than a keyboard, there is something about a pen I prefer. Things slow down and there is more time to think before moving a word from the mind to paper. Perhaps this is why I miss slower attached ski lifts where there was more time for conversation and taking in the scenery with friends. Clearly faster is not always better. This week we continue in the 40-day season of Lent. The season in which we ponder and pray about the cross and resurrection of Jesus. It certainly is an opportunity to come clean with ourselves and others with regard to things we have done we wish we had not and things we did not do we wish we had. And of course, these 40 days are an invitation to intentionally spend more time with our loving, gracious, and forgiving Creator. Over the days ahead, I invite you to join me in thinking about those situations or relationships in life in which, like a pen pointed toward the sky, things are just not flowing like they should. Think about hitting the pause button and while stopped, think about needed adjustments on your part. And the idea of stop and adjust is what repentance is all about. It is about stopping and turning ourselves back toward God instead of away from God. The Good News is that God never needs to stop and adjust when it comes to you and to me. God is always in the right position in that regard, which is one of welcome and love.